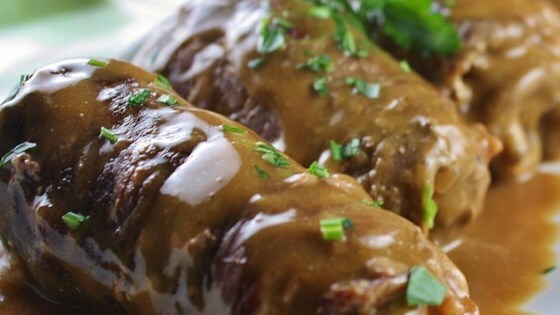 "This is another great German recipe that reminds me of my mom's wonderful cooking. Enjoy this unique and delicious dish!" Spread 1/2 tablespoon mustard over one side of each piece of meat. Sprinkle the onion, paprika, salt, and pepper evenly over the steaks. Lay one slice of bacon on each piece. Roll the steaks jelly-roll style and secure with toothpicks. Heat the canola oil in a skillet over medium heat. Cook meat on all sides until browned. Add the beef broth and water; bring to a boil. Reduce heat to medium low; cover and simmer until tender, about 30 minutes. Remove the meat rolls. Strain the broth mixture and return liquid to the skillet. Whisk together the cornstarch and 1 cup of water. Slowly pour the cornstarch slurry into the skillet, stirring continually until the sauce has thickened, 2 to 3 minutes. Stir in the sour cream. Return rolls to the sauce; serve immediately. Discover one of the simplest stuffed meat recipes Chef John knows! I seared the meat rolls first in my pressure cooker and then cooked them for 30 minutes. These were great with noodles!